Family portraits are not taken lightly with Neal Urban! We like to have some fun and create something different and matches your families style! This family wanted portraits done around downtown Buffalo. We started on Main St. in Buffalo in the Theater district. Then took the walk down to Lafayette Square. We stopped along the way and did photos anywhere that caught our eye. They got so many different back drops and scenes! It was such a great idea to walk. A small back story that makes this photo even better. One of the kids set this shoot up! He gave us the family dynamic and mentioned his parents were divorced and both remarried. But, they wanted everyone in the photos. There would be no issues and all family members got along and were always together! Perfect! This image included everyone. It was done in the middle of Lafayette Square. There is a giant monument and the stairs are great for larger groups of people for photos. Everyone looks cool and collected. All outfits are coordinated but not matching. The whole family was having a great time! For larger family sessions, we not only do large group shots, but do divide up the smaller families for photos. We also try and grab solo shots of each. 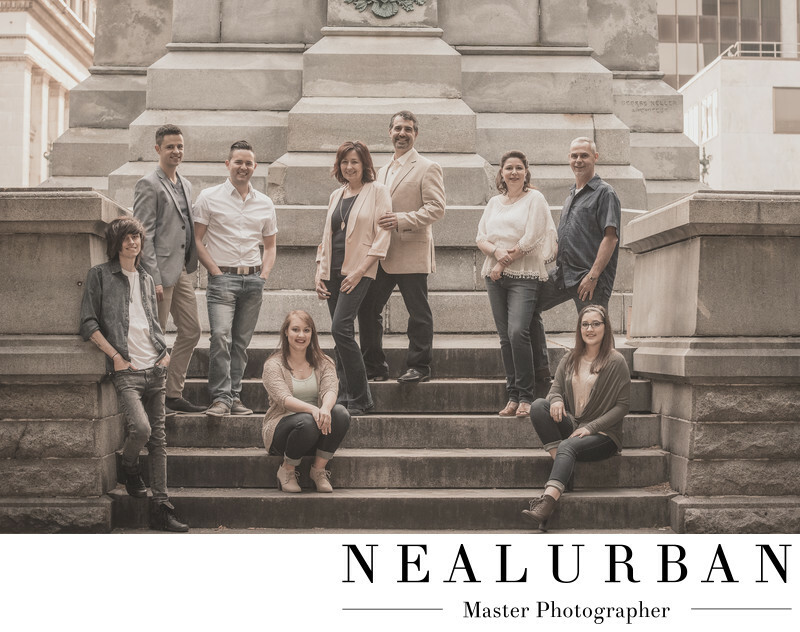 If you want a not so traditional style of family photo, Neal Urban Studio can help you there!